A little bit of thunder and a whole lot of flash…. 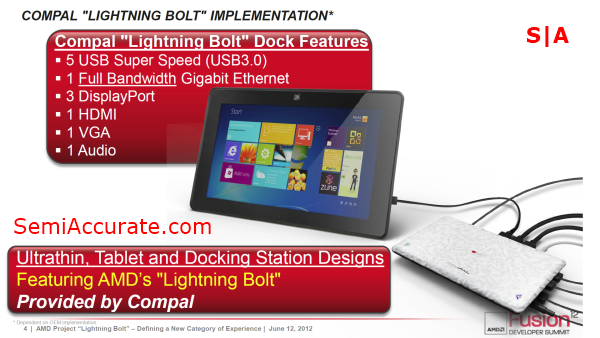 Last year Intel introduced the first products based off of its proprietary Thunderbolt interface. Since then Thunderbolt has made its way into the high-end motherboard market and into laptops from a number of major OEMs. Of course these have all been laptops and motherboards based on Intel platforms, and AMD has been essentially unable to respond. But even without any direct competition, Intel has been having quite a bit of trouble convincing consumers to adopt Thunderbolt. 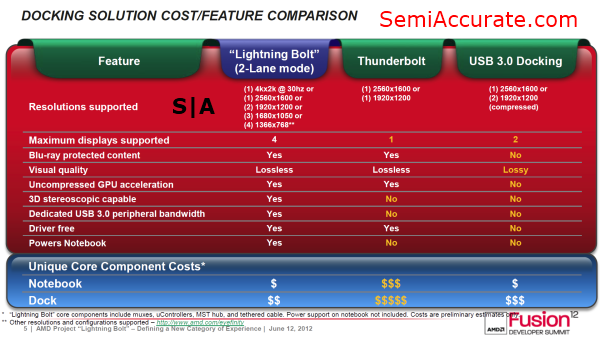 One of the biggest barriers to the wide spread adoption of Thunderbolt has been its relative cost compared to USB 3.0 and other standardized technologies. Thus Intel has yet again created an opening for a low cost competitor to spark some life into this otherwise dull market segment, and AMD is working to be that competitor. To this end AMD has Lightning Bolt. Now Lightning Bolt doesn’t attack the same high-bandwidth market that Thunderbolt is aimed at, (that’s what external PCI-E is for) but it does attack the more practical side of Thunderbolt by taking the multi-device and electric charging capabilities that Thunderbolt offers and expanding upon them. Lightning Bolt allows for a single DisplayPort 1.2 connector, using a special Lightning Bolt capable cable, to connect to a dock. The dock is able to power up to three additional display outputs, as many USB ports as you want, a gigabit Ethernet port, audio ports, and will even charge your laptop. This is all thanks to the clever use of standardized I/O technologies that AMD calls project Lightning Bolt. AMD’s Lightning Bolt is really a three part technology; one part capable laptops, one part capable cables, and one part specialized docking hubs. While this may sound like a lot of pieces, the advantages of having Lightning Bolt over a standard DisplayPort or even Thunderbolt are obvious. 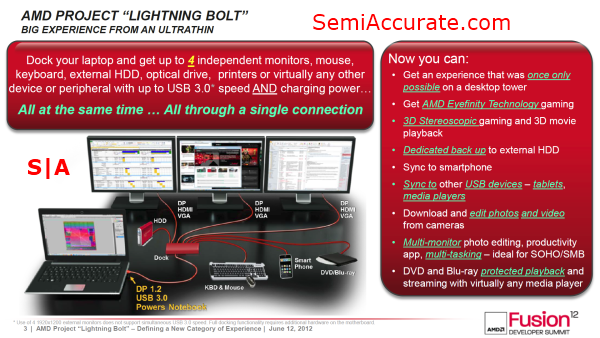 With only a single DisplayPort on a Lightning Bolt capable device, you can have access to a plethora of connectivity options ranging from Eyefinity to five USB 3.0 devices, and best of all you can use all of those options concurrently. 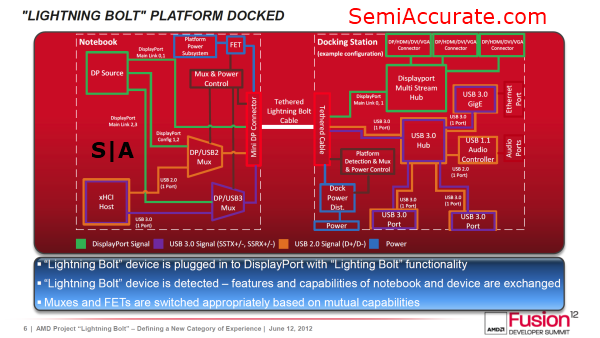 This is why Lightning Bolt is a proposition that makes a lot of sense for tablets and Ultrabooks which lack the space necessary to offer a lot of ports. At the hardware level Lightning Bolt is a surprising simple, and driver-less, hardware capability that allows the USB 3.0 channels from the chipset and the DisplayPort channels from the APU to be routed over a cable and out to a hub. 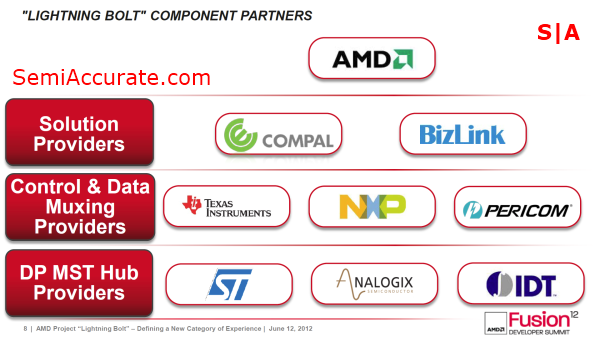 AMD was nice enough to put together the direct comparison table shown above. The key take away here is that Lightning Bolt offers a wider array of capabilities than its competitors for equal or less cost. AMD’s Lightning Bolt is a tantalizing proposition, but I can’t help but wonder if it will fare any better than Thunderbolt did when it comes to OEM adoption. Based on the long list of partners that AMD is working with, there is little doubt that we will be seeing project Lightning Bolt on at least a few flagship laptops and tablets. Thomas Ryan is a freelance technology writer and photographer from Seattle, living in Austin. You can also find his work on SemiAccurate and PCWorld. He has a BA in Geography from the University of Washington with a minor in Urban Design and Planning and specializes in geospatial data science. If you have a hardware performance question or an interesting data set Thomas has you covered.